The 2017 Engineering Exhibition was held on Thursday, 21st April, in the Nexus Centre in CIT. This year's Engineering Exhibition presented 200 stands. Once again, chemical engineering joined our colleagues in mechanical, manufacturing, biomedical, sustainable energy and transport engineering to showcase the results of final year projects. The chemical and process engineering Research Project is worth 10 credits and is concluded in the first semester, and although the final years are currently reaching the conclusion of their Design Projects, this was an opportunity to present their capabilities to the industrial visitors to the Exhibition. 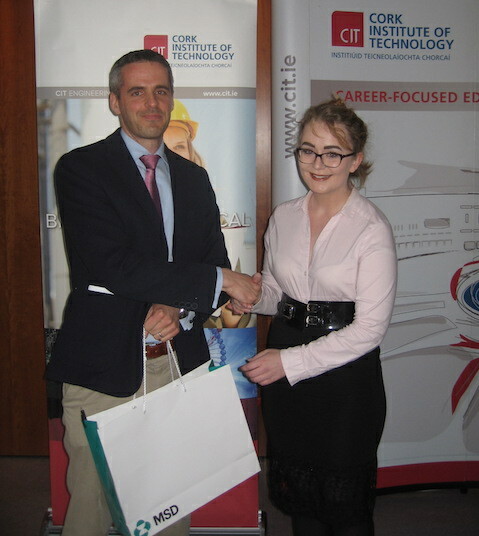 Leanne O'Reilly’s poster was judged the best of the chemical engineering research project posters exhibited at this year’s Engineering Exhibition. Leanne's project was part of her final year work on her B.Eng (Hons) in Chemical & Biopharmaceutical Engineering and was entitled: “Process Control System Rationalisation” and was conducted in partnership with BioMarin. Her project supervisor was Mr. Ian O’Sullivan. Her hard work was rewarded by receiving the MSD Prize for Best Poster. We thank MSD for their generosity. See below for images of some of our final year class. Not all the posters were presented due to their being projects with industry where confidentiality restricts their publication - so not all our students are featured. Click on the images for a larger view. This page last updated 9 May 2017.